This review is for the Gibson Guitar Lessons that come when you buy a Gibson guitar in their Maestro range. You may also get it when buying other Gibson guitars but I am unsure – though when I bought my Les Paul years ago I didn’t so I suspect it’s only on their lower end guitars that come with a package. The main purpose of this review is to establish a standard against which other free and paid online guitar lessons will be reviewed on this site. Because the Gibson lessons are free and the DVD comes with the guitar it isn’t expected to be brilliant but it also isn’t expected to be complete rubbish given that it is from a well respected guitar company (albeit for their lower quality products). And that’s pretty much what you get. It’s not brilliant in terms of how much you get but what is there is pretty good. And there are also a whole lot more when you go to Gibson.com. Again what you get there is really good stuff – but you don’t get everything. Of course there is a paid course that you can purchase (set of DVDs) but the free stuff is pretty decent – it’s just incomplete (assumably with the idea that once you get a taste you’ll want the complete lessons). 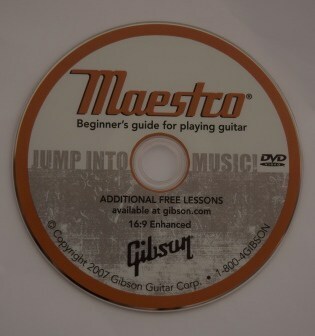 The original DVD that came with the guitar essentially goes over the basics. This covers the very basics. But these basics are needed if you are just starting out playing guitar. Even if you’ve been playing guitar for a while but are self taught or had a teacher who wasn’t that thorough there are possibly some things in here for you too. You get around an hour’s worth of video. 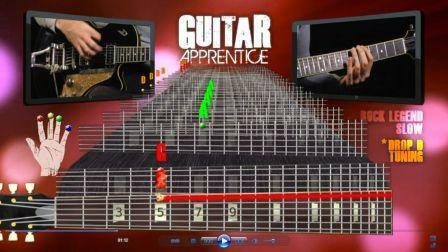 They have something on the DVD which is called “guitar apprentice” which looks kind of like Guitar Hero. Now, as much as I do enjoy that game it’s not a way that I would learn the guitar – but maybe I’m old school! If you like the idea of learning like guitar hero then maybe it would suit you. They only have one song you can learn on the DVD but there are more that you can get on their website. If you are looking for a more traditional learning style then check out Gibson’s Learn & Master – Gibson’s legacy learning systems. This is by the same guy as does a lot of the free lessons on Gibson’s website. I was pretty impressed with how much they actually give you for free here. It’s not complete and it’s obvious your missing some steps – but what they have is pretty good and there’s quite a lot there. The lessons on Gibson’s website are split into two teachers essentially. Steve Krenz is the first one and he is also the author of the Learn and Master series mentioned above. His teaching style is pretty clear and I found the lessons pretty easy to follow. The second guy is Arlen Roth. His focus is mostly on electric guitar so if that’s what you’re mostly into then this might be the one to check out first for you. Steve Krenz does a bit of a mixture of electric and acoustic stuff. There’s my brief overview of the Gibson Guitar Lessons. I hope you found this useful and if you use the guitar lessons I hope they are useful for you too. This certainly isn’t a complete way to learn the guitar – but it gives you a taste. Check out the link below for reviews of more online guitar lessons that do have complete systems to teach you how to play guitar. Hey Dominic – yeah it is a good free way to get started learning guitar but not the only one. I’m not sure if you can get the DVD free online but you can probably find somewhere to download the lessons online though I haven’t seen it anywhere. There are free guitar lessons on Gibson’s site but not the stuff that’s on the DVD. The stuff on the DVD is for very very beginner guitarists. Gibson also have DVDs that you can purchase.